Actor Finn Wittrock wrote recently at the New York Times about helping to start a mini Shakespeare company in the 1990s to entertain his parents and other theater professionals. He recalls with wonder his young self’s confidence of success. “I was born in the Berkshires in Western Massachusetts. I lived there until I was 6, then moved to Evanston, Ill., and later to Los Angeles. But every summer for most of my youth, I would go back East with my brother, my mom and my dad, who most summers was acting or teaching for Shakespeare & Company. I would often be cast as a page or an altar boy in one of the professional productions. “I went in lieu of a summer camp; I went to romp in the Berkshires, see old friends, get out of the city. But mostly I went for the Very Young Company. “No one gave us permission to do the Very Young Company; no one ordered us to do it, and no one had to boost our confidence to do it. We just did it. We were just kids howling Shakespeare to the Berkshire trees, and our readiness was all.” More at the New York Times, here. At one point in my childhood, I, too, was confident. I thought, if my parents would only call the movie theater and set it up, four of us kids — the Gordons, one of my brothers, and I — would be a smashing success performing our version of “Snow White and Rose Red” before the feature. The grownups didn’t quite believe in it. Some neighbors and I did perform an original play about a snowman for family members. One of the actors returned a copy of the pencil-scrawled script to me at my aunt’s funeral in 2002, decades later. 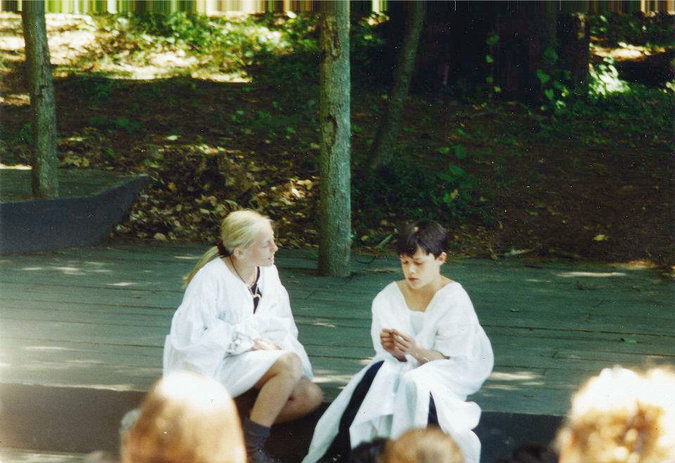 Finn Wittrock, right, and Rory Hammond, enacting the killing of Lady Macduff and her son in a mini-“Macbeth.” The young actors formed their own company more than 20 years ago to entertain their parents and other professionals at Shakespeare & Company in Lenox, Mass. What is it about kids and putting on plays? We did this all the time and insisted on an audience. The grownups were usually good sports. It never would’ve occurred to us to do Shakespeare, though . . . Sometimes it’s the only way to get the grownups to sit still, look at you, and listen to what you are saying. And maybe applaud.